Ansel Adams wasn’t born, so to speak, with a camera in his hands. In fact, it would be better—if we stick with that train of thought—to say that he was born with a keyboard in his hands. Why is that? Because Adams gave up a promising career, as a pianist, to become a professional photographer. It was “inevitable infection,” the great photographer says, which caused him to switch professions. One thing common to both fields, though, is discipline. Discipline and patience. A pianist needs lots of discipline to learn the notes perfectly, to practice frequently and to perform flawlessly. Have you taken the perfect picture yet? No. The best picture is around the corner, like prosperity. It’s not surprising Adams gave that answer. Born in San Francisco, Ansel—an only child—was just four when the Great Earthquake of 1906 shook the city. In his home, located amid the dunes of the Golden Gate, Ansel experienced a traumatic event when an unexpected after-shock violently threw him to the ground. Sustaining a badly broken nose, which was visible for the rest of his life, Ansel recovered from his injury but his father never regained what he had lost in the financial panic. This loss of circumstance negatively impacted the family, especially Ansel’s mother (Olive Bray Adams). Natural shyness and a certain intensity of genius, coupled with the dramatically “earthquaked” nose, caused Adams to have problems fitting in at school. In later life he noted that he might have been diagnosed as hyperactive. There is also the distinct possibility that he may have suffered from dyslexia. He was not successful in the various schools to which his parents sent him; consequently, his father and aunt tutored him at home. Ultimately, he managed to earn what he termed a “legitimizing diploma” from the Mrs. Kate M. Wilkins Private School — perhaps equivalent to having completed the eighth grade. Among the many things Ansel learned from his father, with whom he had a close relationship, was a love of nature. The older Adams respected the ideals of Ralph Waldo Emerson who believed in living modestly and morally (with a particular emphasis on one’s responsibilities to both mankind and nature). At the age of twelve, Ansel taught himself to read music and play the piano. In addition, he spent time walking in his neighborhood, exploring the great vistas of the Golden Gate and its still-wild surrounding areas. During his walks he was accompanied by the Kodak No. 1 Box Brownie camera he’d received from his parents. Joining the Sierra Club, in 1919, Ansel spent four summers in Yosemite Valley where he was “keeper” of the Club’s LeConte Memorial Lodge. He fell in love with a young woman, Virginia Best, whom he met during his time in Yosemite. Making music together—he, on the piano, and she, with a lovely contralto singing voice—they would ultimately marry and have two children (Michael and Anne). Each summer, the Sierra Club sponsored a High-Trip, lasting a month, when around 200 members hiked to various beautiful places, often in the Sierra Nevada. Ansel photographed these trips and published his work in the Club’s Bulletin. Literally the day after they met, Bender set in motion the preparation and publication of Adams’ first portfolio, "Parmelian Prints of the High Sierras" [sic]. Bender’s friendship, encouragement, and tactful financial support changed Adams’s life dramatically. His creative energies and abilities as a photographer blossomed, and he began to have the confidence and wherewithal to pursue his dreams. During that same year, Ansel also met photographer Edward Weston. The two became friends and collaborators. In 1933, Adams met the artist he admired more than any other, photographer Alfred Stieglitz (who was married to the famous artist Georgia O'Keeffe). Living in New York at the time, Stieglitz opened many doors for Ansel. With his photography career moving forward, Adams realized he could support himself with his pictures instead of with his music. Although he didn’t make the switch overnight, he ultimately walked away from a life at the piano to focus on a life with his cameras. ...[Ansel Adams] did for the national parks something comparable to what Homer’s epics did for Odysseus. View of valley from mountain, "Canyon de Chelly" National Monument, Arizona (1941). 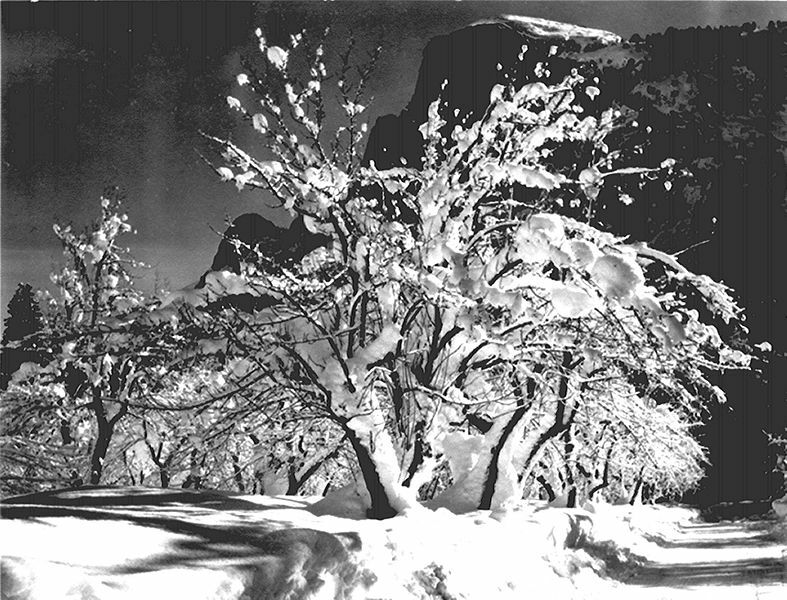 Trees with snow on branches, "Half Dome, Apple Orchard, Yosemite," California. April 1933. 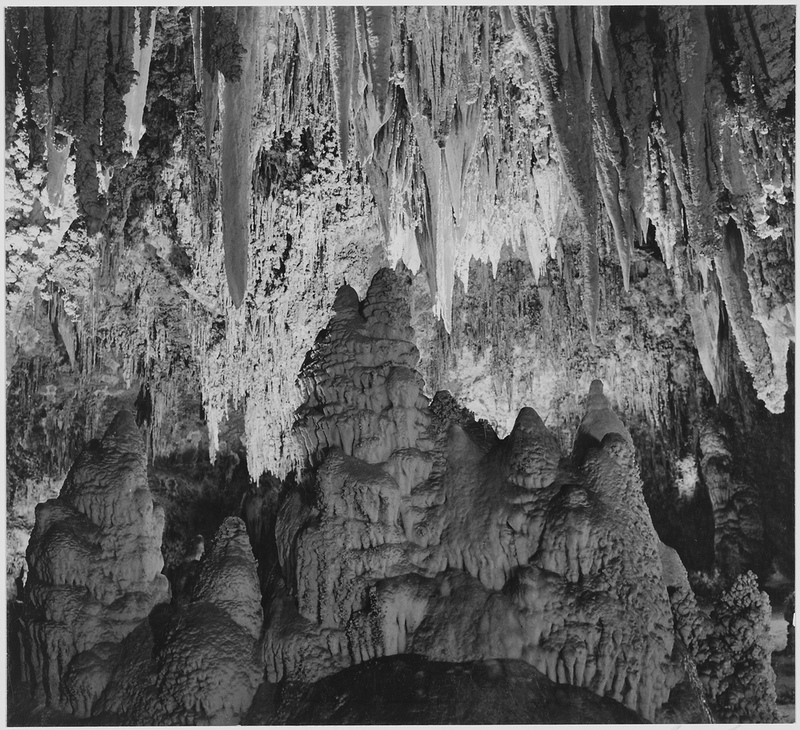 "Formations along the wall of the Big Room, near Crystal Spring Home, Carlsbad Caverns National Park," New Mexico. (Circa 1941). Because he was employed by the federal government, when he took these photos, the copyright for them belongs to the American people. Ansel Easton Adams (1902-1984) remains one of America's best-known (and most-loved) photographers. 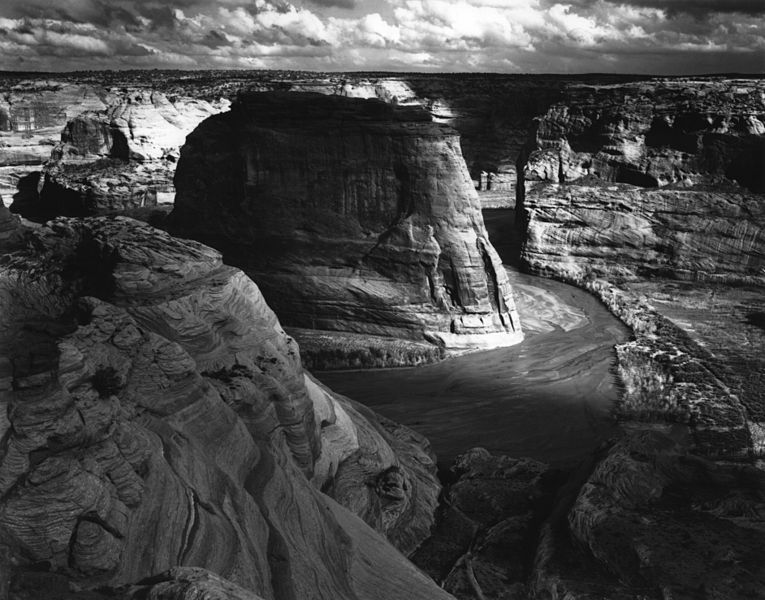 Many of his pictures are black-and-white nature scenes (from America's national parks and monuments) and landscapes (depicting the American West). Extremely troubled by the Japanese-American relocation, which the federal government ordered at the beginning of World War II, Adams tooks pictures of the Manzanar internment camp. Located at the foot of Mount Williamson, in the arid Owens Valley of eastern California, Manzanar remained open until the end of the war. The image, at the top of this page, depicts a photo portrait of Adams, c. 1950, by J. Malcolm Greany. It initially appeared in 1950's Yosemite Field School Yearbook. He didn't believe that the color processes of his day could produce results to compare with the rich visual deliberation, the fine-grained luxuriance of his work in black and white. Adams’s energy and capacity for work were simply colossal. He often labored for eighteen or more hours per day, for days and weeks on end. There were no vacations, no holidays, no Sundays in Ansel Adams’s life. Frequently, after and intense period of work, he would return to San Francisco or Yosemite, promptly contract the “flu,” and spend several days in bed. 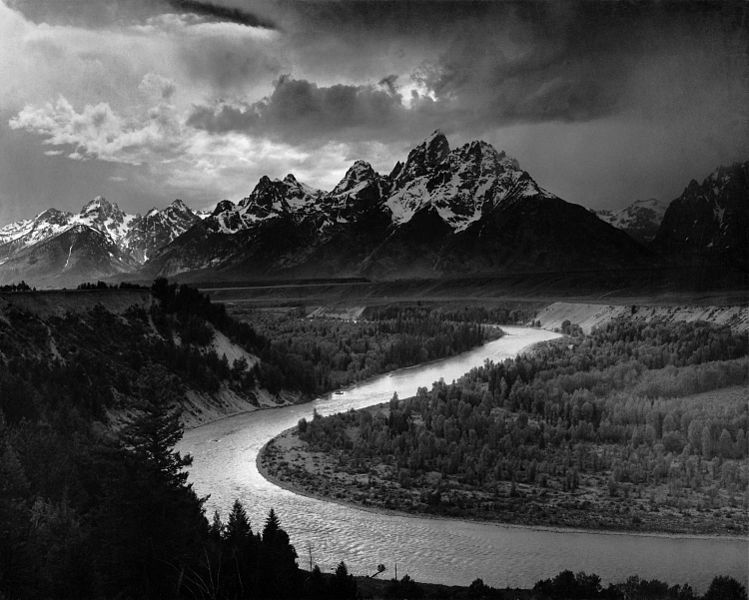 What was Ansel Adams’ special approach as he created his art? In other words ... he wanted to “see” the end result—as an internal event, inside himself—before he created the photograph with his camera and his various techniques. It never was just about "taking pictures" with Ansel. His work was about the creative process of finding (and beautifully capturing) wonderful scenes to share with others. I make the photo and give you the equivalent of what I saw and felt—sharing the reality of the moment, one step removed. Virginia Best Adams outlived her husband by 16 years. She died, at the age of 96, in 2000. Bos, Carole "Ansel Adams" AwesomeStories.com. Jul 25, 2013. Apr 25, 2019.